Lit picture of my newly purchased LED C7 retrofits made by Minleon. These are "ceramic" style and use a SMD LED with a light pipe to create a fairly good representation of a traditional ceramic C7. These are quite bright, a touch brighter than some of the brightest 7w C7's I recall. The warm white, red and yellow are seriously almost indistinguishable from a real incan C7. The blue and green are too "pure" and look fake due to their monochromatic color. 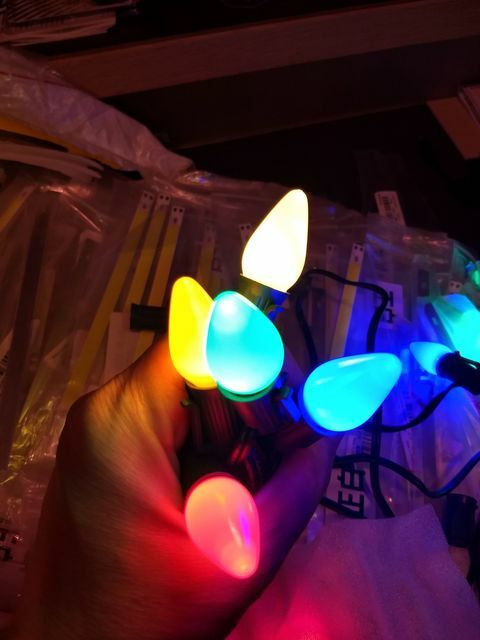 I am going to suggest to the vendor of these LEDs to consider making the blue and green LEDs using a warm white emitter to give a "soft glow" effect. I did light the blue and green LED using my warm-white LED penlight, and that looked way nicer and totally like the old school incan C7. Anyways, these are pretty good LEDs. Except for the blue and green being too "pure", they are nearly perfect. Thank you for posting. I've been waiting for someone to try some of those and compare them to incandescents!